Horsham District Council has approved the building of an access road to a 57-home estate planned by one of its own members. John Bailey (Con, Rudgwick) wants permission for the homes at Windacres Farm, not far from land he sold to Berkeley Homes, where another 55 homes are currently being built. The site itself is in the Ewhurst parish, meaning Waverley Borough Council will have the final say on whether the 57 homes can be built, but the access road falls within Horsham’s boundary. It will run between two houses on Cox Green, Rudgwick, up to the development site and will only be built if the development is approved by Waverley. The council received 136 letters opposing the plans, with Rudgwick Parish Council and Rudgwick Preservation Society also objecting. Concerns included a lack of infrastructure and services to cope with extra demand, road safety, loss of countryside and overdevelopment, the impact on nearby properties, ecological damage and increases in light and air pollution. The access road was approved by HDC’s planning committee north on Tuesday (November 6). 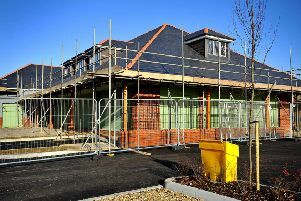 Waverley Borough Council, has received a number of objections to the 57-home development, and is expected to make a decision before the end of the month.